The Sanctuary at Ol Lentille is a leading edge conservation tourism partnership between a Maasai community, donors and private investors John & Gill Elias who are resident at the Ranch. Here there is true synergy. With the sacrifice of a full one third of their grazing area for conservation, the community has been able to enter the tourism business. The business finances the conservancy, and provides an income to the community to improve lives and livelihoods. 14,500 acres of stunning hills and valleys populated with exceptional flora and fauna have resulted. Four fabulously luxurious fully staffed, full service houses are available either individually or as exclusive use of the whole property. The property also boasts a Library, Spa and Pool, and enjoys wireless access to the internet via satellite broadband. Each architecturally designed House echoes a “Voice of Africa” and is located to ensure your privacy. All the Houses have an abundant mixture of unique courtyards, decks, gardens and lawns. Some have plunge pools and each bedroom has its own ensuite bathroom. 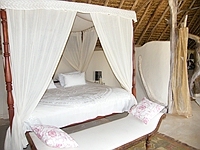 • The Chief’s House in African contemporary style has 3 bedrooms and sleeps 6 as doubles or twins.